1. Printing mistakes. Say you screw up a dodge or a burn, set the timer incorrectly, or whatever: don’t throw that piece of paper away. Save and develop it with the lights on so it turns completely black. Process normally. You can use it for a dodging/burning sheet--the black side goes down so as not to scatter stray light--or use it to make masks, dodging tools, burning tools, etc., or put it in the easel to focus on. 2. Dodging and burning. What kind of wire to use for dodging tools? The thinner the better. The best I’ve found comes from sporting goods stores and is used to make blowgun darts. It is very thin, stiff, and comes in an anodyzed black finish. I used a blowtorch to solder a paperclip on the end of one, so I can attach any shape to it. I make dodging tools on an as-needed basis using Scotch 235 Photographic Tape. I’ve found that it helps to feather the edges on most tools. There are few prints that won’t benefit from some judicious dodging and burning. Always keep your tool moving continuously--when done properly, no one should be able to tell that the print has been manipulated. I keep several sheets of developed-out photographic paper with various-sized holes in the center for burning, and at least one with an off-center hole. I also use pieces of paper to cover up portions of the print I am not burning. 3. Consistency and creativity. When you first begin learning to print, it is important to be consistent. Start with one paper and one developer and learn their properties before moving on to other products. Beginners tend to make a lot of prints because they tend to take a lot of photographs--and the best way to evaluate your negatives is to print them yourself. I used to make 20 or more prints from a dozen or more negatives in a printing session. After you have learned the properties of a number of papers and developers, you will have more range for creativity. You can choose a paper and developer to obtain a certain effect, and you can begin to consider other possible manipulations. Sometimes you will have a negative that you know would make a great print, but you can’t seem to get what you want out of it. One photographer’s advice for such a situation was, “go into the darkroom and don’t come out until you’ve got it.” Also, don’t be afraid to innovate. It is almost impossible to obtain a perfect negative, so you can assume at the outset that a truly striking print will require some dodging and burning, and possibly quite a lot. You may have to mix various developers to obtain the effect(s) you seek, or you may have to use two developer solutions, extended development, reduced agitation, etc. As you progress, you may spend an entire printing session making only one or two fine prints. If you really want great prints, don’t compromise--time and devotion are essential. Learn to use developer additives, bleach and redevelopment, selective bleaching, latent image bleaching, print flashing, masking, solarization, and toning to obtain the qualities you desire in a fine print. 4. Two developers. Ansel Adams, John Sexton, and many other photographers use (or used) two different developer trays when they print. The first tray typically contains Selectol Soft and the second Dektol. The procedure is to develop almost to completion in Selectol Soft, which gives a delicate gradation, then to finish development in Dektol to bring the blacks up to snuff. But the possible variations are many--you can vary the times to obtain various gradations. I sometimes use Ansco 120 for the first developer and Ansco 130 for the second. (Ansco 120 is nearly identical to Selectol Soft.) If you are using a single developer and aren’t getting the result you desire, you should not hesitate to modify it as necessary: add more Dektol to up the contrast, add Selectol Soft to reduce contrast, add restrainer to clear the high values, or add carbonate to strengthen the blacks. Whatever it takes will be worth it to get the print you desire. 5. Highly dilute developers. I hadn’t used this technique much until I tried Agfa 115, also known as Dassonville D-3. Agfa’s recommendation was a 1:4 dilution, but Steve Anchell recommends using it at 1:7 or even 1:14. I’ve been using the 1:7 dilution with stunning results with chloride papers--a very long scale with smooth gradation. Developing times are 3 to 10 minutes, with most prints falling at about 5 minutes. Normally, you will not see the image begin to emerge until you are 60 to 90 seconds into development. Contrast can be controlled to some extent by extending or reducing development and/or agitation. If I need to get more detail in the high values, I simply let the print sit in the developer with no agitation for 3 to 5 minutes--the developer quickly exhausts itself in the low values, but continues working in the high values. I’ve achieved glowing skin tones on many nudes using reduced agitation like this (see below). The chloride papers have a longer scale than bromide papers anyway, and the long development times bring out their best qualities. There is also something to be said for learning patience in the darkroom--I don’t make as many prints in one session with diluted developers, but the overall quality tends to be much higher. 6. Agitation. Agitation should be continuous for at least the first minute of development. You will find it very instructive to develop a piece of paper with the lights on in order to see what portions of the image develop first--if you just let the paper sit there, you will definitely get uneven development. It takes some time for the developer to diffuse evenly into the emulsion. Ansel recommends turning the paper over continually in the developer and leaving the print face down much of the time to reduce exposure to safe lights. He cautions against doing this with amidol formulas, because exposure to air causes the amidol to oxidize and stain the print. I would also caution against doing this with glycin formulas (specifically Ansco 130). My personal preference is to leave the print face up while picking the tray up in both hands and rocking it back and forth--both side to side and top to bottom. For larger trays I resort to alternately lifting the sides, top and bottom of the tray. For curling paper, I often spend the first 30 seconds of development holding one edge or another of the paper down with tongs while I rock the tray, but most papers will flatten within the first minute. Normally agitation is continuous throughout development, but if you have delicate high values in a print that are not developing out, after the first 60 to 90 seconds of agitation, you can let the print settle to the bottom of the tray and continue development with no agitation. In areas of heavy exposure the developer will be quickly exhausted, but development will continue for quite a long time in the high values of the print. Hence, contrast and gradation are altered. Typically, you will at least double your development time with this technique. 7. Development time. Most papers recommend a development time between 1 and 2 minutes. Some low activity or dilute developers may require 3 to 5 minutes. If you shorten development time too much the low values may remain weak, whereas if you develop too long the high values may become degraded (depending on the developer, paper, etc.). With warm tone paper, development time affects image color--the image tends to cool as development time is lengthened. This effect is probably due to aggregation of silver grains as development is extended. Michael A. Smith uses an amidol developer with Azo paper, but only develops for one minute. He says longer development makes the paper too cold for his taste. Following his suggestion, I have found that reducing development time on warm papers can significantly increase the warmth. The difference between 2 and 3 minutes with Ilford Multigrade Warm is significant, and increasing exposure and reducing development to 1 minute will give very warm tones. If you want a really cold tone with a warm paper, you can place the print in a water bath for a few minutes, which allows it to continue developing, but very slowly, giving an unusual effect (and if the highlights are a bit overdeveloped, I’ve found that a little Farmer’s reducer will perk them up without affecting image color over much). 8. Restrainers and anti-foggants. The most common are potassium bromide and benzotriazole. Bromide is considered a restrainer, as it actually restrains the action of the developing agent. Keep a bottle of 10% potassium bromide handy (mix 10 grams in 100 milliliters of water, or 100 grams in a liter of water). Adding 10 milliliters of potassium bromide solution is like adding a gram of potassium bromide. When you do this you will have to retest, as bromide slows the action of the developer while clearing the whites. Bromide also tends to warm the image slightly, depending on the amount added. Bromide imparts an olive green color to the emulsion, which changes to a warm purple-brown when toned in selenium. You can obtain a very warm effect from a cold bromide paper by adding a sufficient quantity of bromide to the developer (say 10 to 40 grams!). Benzotriazole is classified as an anti-foggant, but in practice it has a similar effect to bromide--it slows the action of the developer and clears the whites. Keep a bottle of 1% benzotriazole handy (mix 1 gram in 100 milliliters of water, or 10 grams in 1000 milliliters), and add it to your working solution developer in quantities of 5 milliliters at a time. Benzotriazole is preferred by photographers who seek cold tones, as it tends to shift image color slightly toward the blue. 10. Bleaching. Bleaching of the entire print is usually accomplished by placing it in a tray filled with Farmer’s Reducer for Prints (see the Formulas page). I keep a bottle of solution A handy at all times, but in my experience solution B (24% solution of sodium thiosulfate) doesn’t keep well. I use four teaspoons of hypo (sodium thiosulfate) in a liter of water and add a quarter-ounce of solution B. I often I use this solution to salvage a print that I have overexposed. Sometimes I purposely overexpose, then bleach, in order to increase contrast. I refix after bleaching, then soak the print in hypo clearing agent for 3 minutes. Toning a bleached print in selenium will usually produce a warmer color than an unbleached print would have. 11. Selective bleaching. Bruce Barnbaum had an article on selective bleaching in Photo Techniques magazine a few years ago, which is where I learned the technique (Vol. 17, No. 6, Nov ./Dec. 1996). He goes into much greater detail than I do here, so his article is well worth reading. One advantage of selective bleaching over dodging is that it increases contrast, since light areas are reduced more than dark areas. The following items are required: potassium ferricyanide, glass beaker or measuring cup, brushes in several sizes, a squeegee, a flat surface to place the print on, a bright light, a tray of fixer, and a hose with running water. If your eyes are bad and you need to bleach very fine details you might consider a Peak head loupe, which is a double-lens magnifying device worn on the head--the lenses allow a close-up stereo view. You can get them from jewelry supply stores. I use mine for fine selective bleaching as well as for spotting prints. Selective bleaching works best on bromide papers (cold or neutral papers), because warm papers tend to change color where they are bleached (though sometimes this is desirable). Mix about an eighth- or a quarter-teaspoon of potassium ferricyanide in an ounce of water and dissolve it completely. Re-fix your print for about ten seconds, then wash for a minute. Place the print on a flat surface, preferably angled down, in the darkroom sink under a bright light. Squeegee the area of the print you wish to bleach. Always have your brush with the potassium ferricyanide solution in one hand and a hose with running water in the other--never apply bleach to your print without the hose in hand to wash it off. The bleach solution works fairly quickly, so it should never remain on the print longer than a second or two before you wash it off. You can adjust the bleach to suit your working method--add more ferricyanide if it is too slow, add more water if it is too fast. Use a more dilute solution in low-density areas that might be prone to over -bleaching. Work in a small area at a time. If you need to reduce a large area, start at one end and work to the other: bleach one or two square inches, wash the bleach off, and squeegee the area again before repeating the process. Do not apply bleach to a print with water standing on the surface. Periodically place the print in the fixer for 30 seconds or so, then wash for about a minute. (Since ferricyanide bleach essentially converts silver back to silver halide, you must always re-fix your print after bleaching.) Barnbaum cautions that the areas where the bleach has been applied will continue to bleach somewhat in the fixer, so you should take care not to over-bleach. Be very careful around areas of low density on the print: washing bleach off one area such that it runs over an adjacent area of low density can cause the low-density area to be reduced--you can get some ugly streaks this way. You may have to turn your print sideways or upside-down to prevent this. If you’ve never done selective bleaching before, practice on a test print (or several test prints) before you tackle a fine one. Sometimes the areas you bleach will change color slightly. With bromide papers, this color will usually come out when you re-fix. If an area turns yellow from the bleach and does not wash away, you should fix the print immediately. Sometimes, when working in a small area, I will dip a brush in the fixer and brush it on to neutralize the yellow stain. Prints toned in selenium can be bleached, but they change color markedly, generally becoming warmer. Barnbaum says he sometimes selectively tones certain areas (applying the toner with a brush), then bleaches them specifically to get a color change. I have never tried this, but the technique sounds promising. Potassium ferricyanide is no where near as dangerous as potassium cyanide, but use common sense with it just the same: don’t breathe the dust, don’t bathe in the solution, definitely don’t ingest it, and don’t allow it to come in contact with strong acids. Potassium ferricyanide solutions have very little free potassium cyanide in them, but the more acidic the solution the greater the amount of free cyanide and, should the free cyanide come in contact with a strong acid, deadly hydrogen cyanide gas could be released (see “Bleaches and Reducers, Investigating Electrochemical Reactions,” by Robert Chapman, Darkroom & Creative Camera Techniques, Vol. 7, No. 5, Sep./Oct. 1986). Skin contact with potassium ferricyanide is messy but not hazardous; but, as with most chemicals, prolonged contact should be avoided. Recently I’ve been experimenting with an iodine bleach (see my Formulas page). It is a simple 15% solution of potassium iodide and 5% iodine, which is diluted 1:64 for use. It works very much like the ferricyanide bleach above, though I find that I must be scrupulous about thorough washing before and after the bleach (a good idea anyway). Interestingly, it does not change the color of chloride papers, so I am able to do selective bleaching of warm papers for the first time--I love it! A 1:50 dilution works faster, but I don’t use it for subtle high values. I have tested this bleach with Bergger warm tone and Portriga. 12. Judging dry-down. I always have problems with print dry-down, especially with glossy prints--the prints look great in the wash, but often come out too dark when they dry. Somehow, you have to print them so the high values seem to lack detail, but detail will just appear when they dry. Some people put their test prints in the microwave to judge the dry-down factor. Others buy Zone VI power supplies with a knob to reduce exposure by a certain percentage (but the percentage varies with different papers). Bruce Barnbaum recently came up with a method that seems to work pretty well--he judges his test prints under a low wattage bulb. That way, he prints with a little less exposure than if he had judged the test under a bright bulb, and after dry-down the print looks right under normal light. I’ve tried it, and it definitely helps. I’ve been using a 15 watt bulb at 2 feet and a 25 watt bulb at 4 feet. I’ve also been toning my prints under low-wattage bulbs, as I sometimes have a tendency to over-tone. The only problem is, it can play havoc with print color, if you are toning for a color change. It requires constant vigilance to overcome drydown problems--I recommend a combination of occasionally microwaving your test prints along with judging all test exposures under low -wattage lights. I’ve got the Zone VI variable power supply, but I rarely use it because half the time I forget to set it. 13. Spotting prints. You will need the following items: dyes, brush, bright light, wetting agent, and a mixing palette. I use the Spotone dyes. If you only print on bromide papers and don’t tone heavily, you can probably get away with buying the 3-bottle set, but otherwise you should go ahead and buy the 6-bottle set. You will only have to buy it once, as there is enough dye in one kit to last a lifetime. The dyes I use most often are 1 (blue-black), 3 (neutral black) and B (brown). You need the finest sable brush you can find from an art supply store. I bought 5 or 6 before I found one that works for me--it is marked 00 Shiva Isabey 6229 France, and on the other side it says Kolinsky Extra. This brush is much finer than several 0000 brushes I have. The tip is so fine you need a magnifier to see it--I doubt more than 3 or 4 hairs ever touch the paper. You can use bottle caps to mix dyes in, if you wish. I found a porcelain paint mixing palette at the art supply store that serves me well. It has 5 round depressions, each with a rectangular, angled depression in front of it. 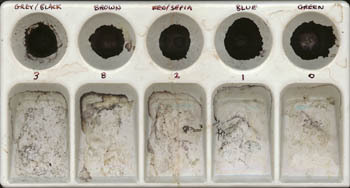 I place a few drops of my most-used dyes in each of the round depressions, and I use the rectangular depressions to dilute and mix the various dyes. I recommend that you let your dyes dry on the palette--they are much easier to work with when dry. Use the brightest light available, and a magnifying device such as Peak head loupe if necessary. Get a glass with a few ounces of water and put a few drops of Kodak Photo-Flo or Edwal LFN wetting agent in it (without the wetting agent, the paper tends to repel the dye). Use a piece of mat board or an archivally processed piece of photographic paper to cover the portion of the print you are not going to spot--this gives you something to rest your hand on and protects your fine print. Never brush free-flowing dye onto a print. Work with a nearly-dry brush at all times--dip the brush in the water and then dab it on a paper towel to remove most of the water. Pick up a little dry dye from your palette and carefully dot it onto the area to be spotted. Only the very tip of the brush should touch the paper--probably just a few hairs. The idea is to create a dot pattern akin to the grains of the photographic emulsion. Always build up the dye area slowly- -you can add more later, but you can’t easily remove it once it’s on the print. Sometimes you will pick up too much dye with the brush--again, dab the brush on a paper towel to remove the excess dye. If you are unsure of the correct color, spot the white edge of the print until you get close. You don’t have to have a perfect color match--as long as the spot is in a small area, no one will notice a minor color variance. Practice on test prints before attempting to spot a fine print. 14. Spotting Negatives. This technique is mostly useful for large format negatives, though it may be attempted on some medium format films. Spotting negatives is generally preferable to etching prints, which involves scraping with a sharp knife blade, though etching may sometimes be necessary for prints made from small format negatives. The problem usually arises due to dust or other matter adhering to the film during exposure, causing a clear spot on the film that prints as black. Since 35mm films are contained in a cassette, the problem doesn’t arise quite as often with them, but will sometimes be encountered in dusty climates. I find I can usually avoid the problem of dust on my large format negatives by carefully cleaning my film holders before I load film. However, dust is difficult to avoid if you have to use a changing bag in the field. You will need the following items: liquid opaque, fine brush, light table, and binocular loupe. Most of the techniques outlined above under Spotting Prints can be applied for spotting negatives, but the dyes used for spotting prints cannot be used for negatives, as they are generally not opaque enough. Kodak used to make a product called Opaque Black that was water soluble. It was only recently taken off the market, so you may still find some in older photo shops. Opaque Black tends to dry to a hard solid, but you can dip a brush in water with a small amount of wetting agent in it, then brush it across the solid Opaque Black and get enough to spot with. I have another product called Perfect Opaque Liquid, manufactured by Retouch Methods Company. This product doesn’t dry out like Opaque Black, yet works very well. A quick web search tells me that Retouch Methods Company is located at 268 Main Street, Madison, NJ 07940 and their phone number is (973) 377-1184. I have read that some people use Photo Maskoid frisket (available in art stores) for the purpose of spotting negatives, but I have never tried it. Place the negative emulsion-side up on the light table and cover the portions of it that you do not need to retouch with some clean mount board or other acid-free paper to protect it from finger prints and grease marks. Dip your brush in the liquid opaque and dab it on a paper towel until the brush is nearly dry, then apply the opaque very carefully to the clear area on the negative you wish to opaque. Try to make tiny dots that will emulate the grain of the film. If this is done properly, it can reduce or eliminate the need to spot the print later. Practice on a throw-away negative until you are confident of your technique. Some people prefer to retouch the base side of the negative, and there are advantages to doing so, though some negatives are too smooth on the base side for the retouch material to stick properly. I recently discovered an entire chapter in Lootens on Photographic Enlarging & Print Quality (7th edition ) on the use of New Coccine or Crocein Scarlet for retouching negatives. I have not used this material, but it comes highly recommended by various alternative process workers. It is always applied to the base side of the negative. Apparently it can be used for extensive manipulation of tonal qualities in the negative. If applied to large areas, brush marks or striations may appear, but these may be less noticeable if the negative is to be used with an historical process such as bromoil or gum bichromate. Crocein Scarlet is still available from Kodak.